Beets have been maligned for years but are experiencing a recent renaissance as people have discovered there are lots of ways to prepare fresh beets. Memories of beets from a can have given way to roasted beet salad and beet gratin. We love beets here at Mile Creek Farm. They are so flavorful, both earthy and sweet and it’s a 2 for 1 vegetable as you can eat both the roots and the greens! 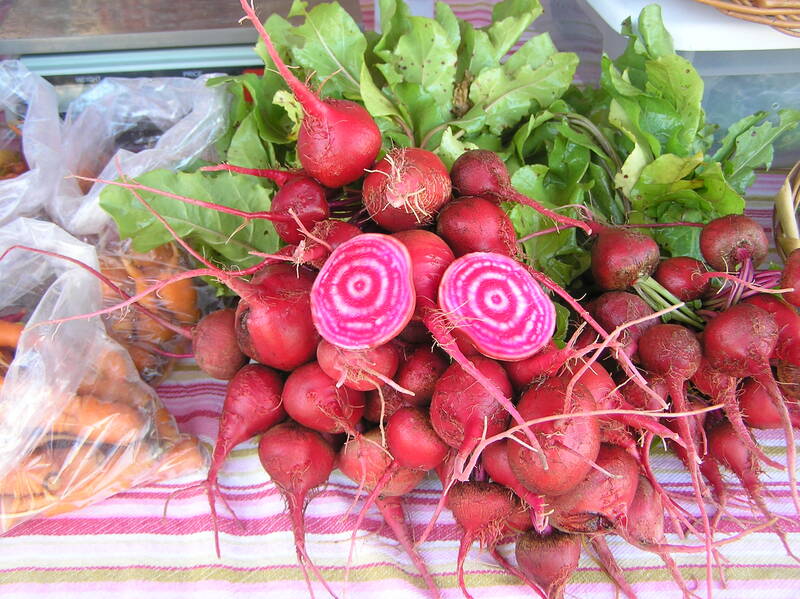 We grow traditional red beets (really purple in color), golden beets and an Italian heirloom, Chiogga, which have a red and white bullseye center. Beets are easiest to prepare by cutting off the tops and root tips and boiling for 30 to 40 minutes or until a fork easily pierces the beet. After they have cooled, the skin will peel right off. You can also roast beet halves with salt, pepper and olive oil in a 425 oven for 40 or so minutes. Again, the skin will peel off when cooled. Beets can then be sliced and eaten plain or with butter, but we like to add beets to things. Beets go well with strongly flavored cheeses, mustard, dill, mushrooms, and sour cream. A simple salad with roasted walnuts, goat cheese and beets is wonderful or you can try these more complex recipes and see if we can’t make a beet lover out of you.